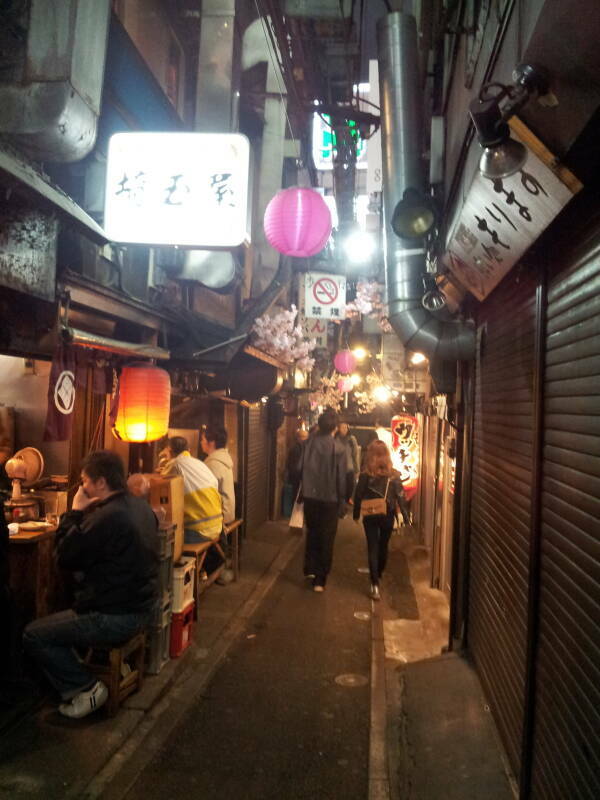 Omoide Yokochō or "Memory Alley" is a cluster of 100 or more small izakaya or taverns. 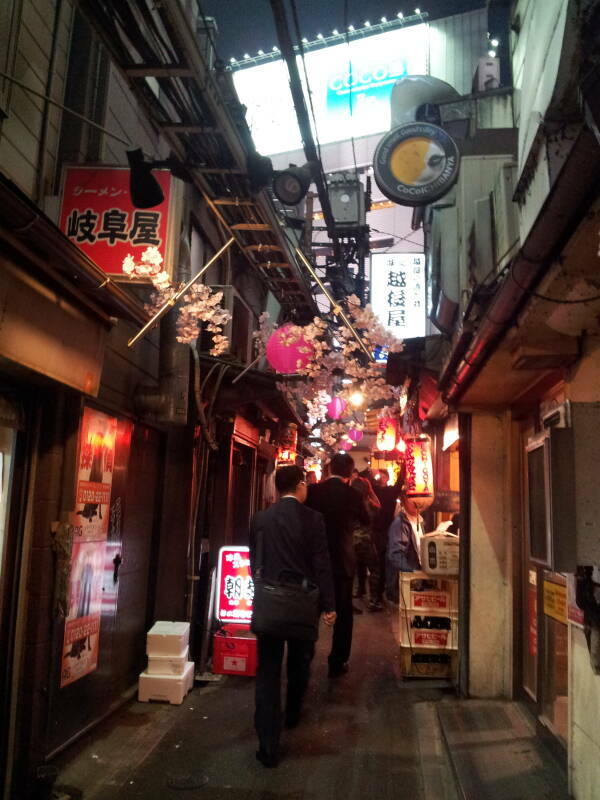 They're in a grid of narrow passageways just north of Tōkyō's massive Shinjuku Station. 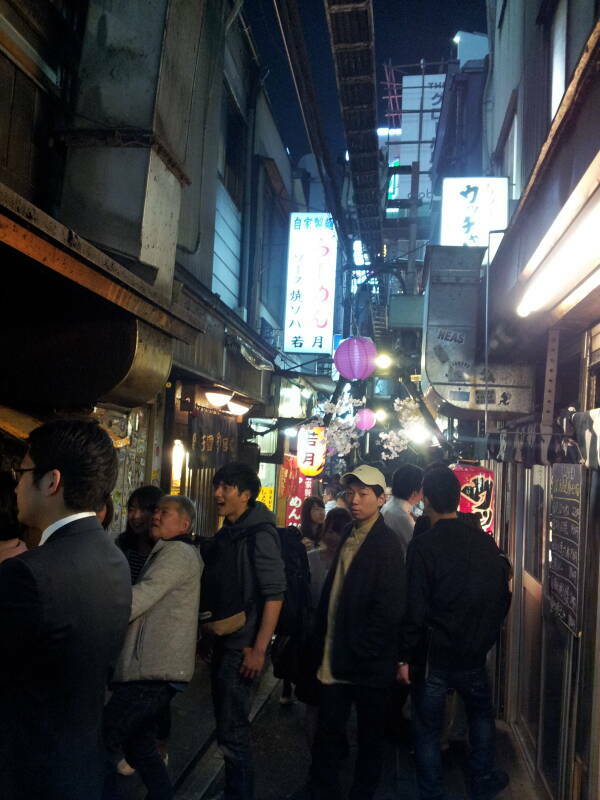 Squeeze in next to salarymen on their way home after a long day in the office. 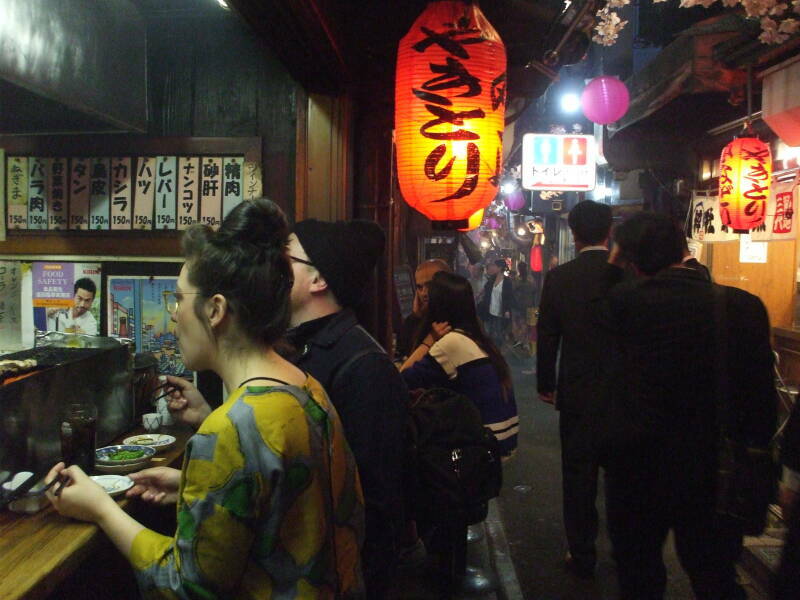 It's the most Anthony-Bourdain-meets-Blade-Runner place to eat in Japan. 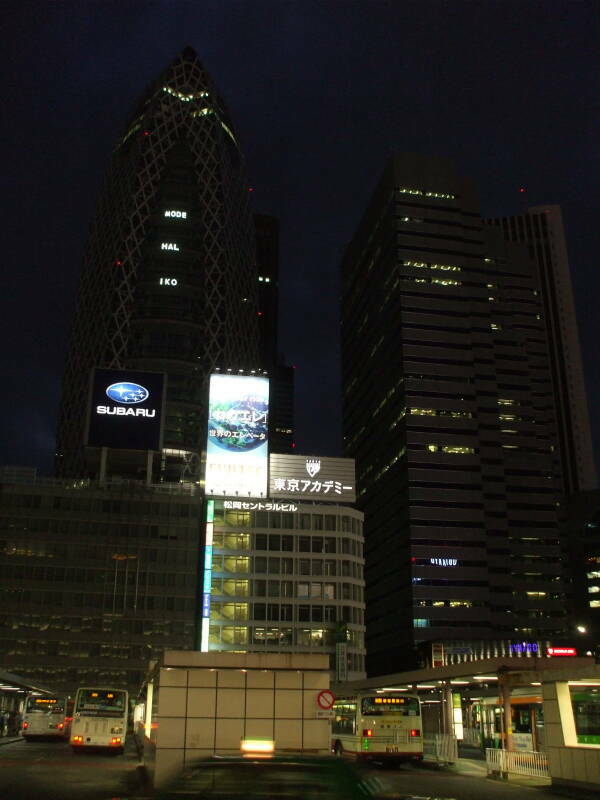 Shinjuku Station is enormous. 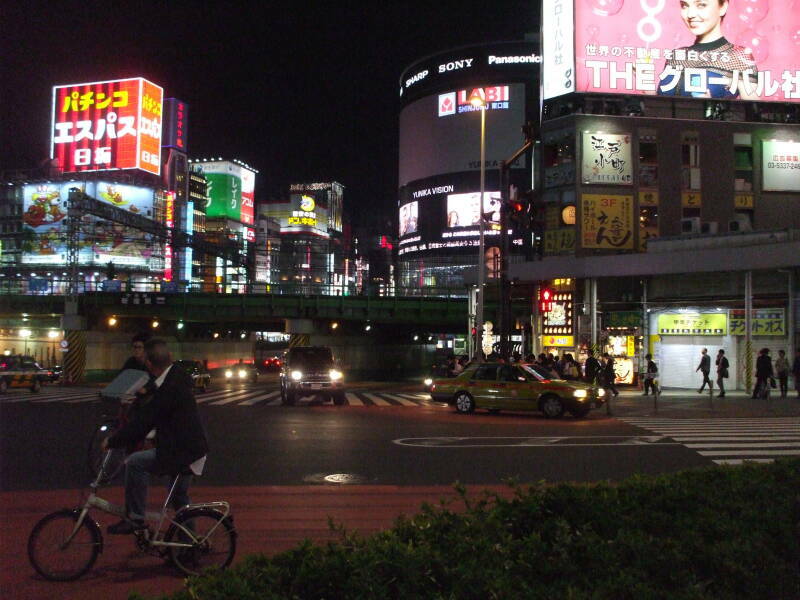 It's the world's busiest transport hub. 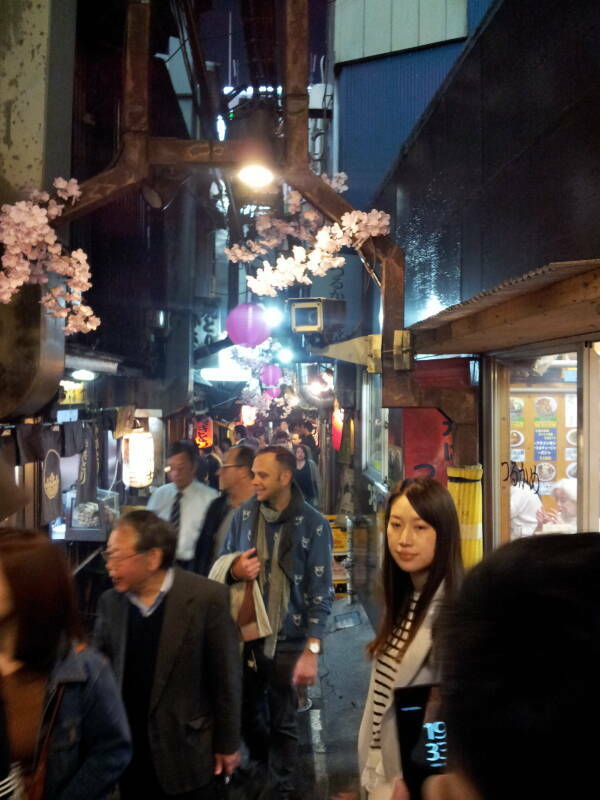 Well over 3.5 million people pass through it every day on the inter-city rail, commuter rail, and subway lines. JR East or East Japan Railway Company operates 16 tracks running north-south. These handle 1.5 million passengers per day. 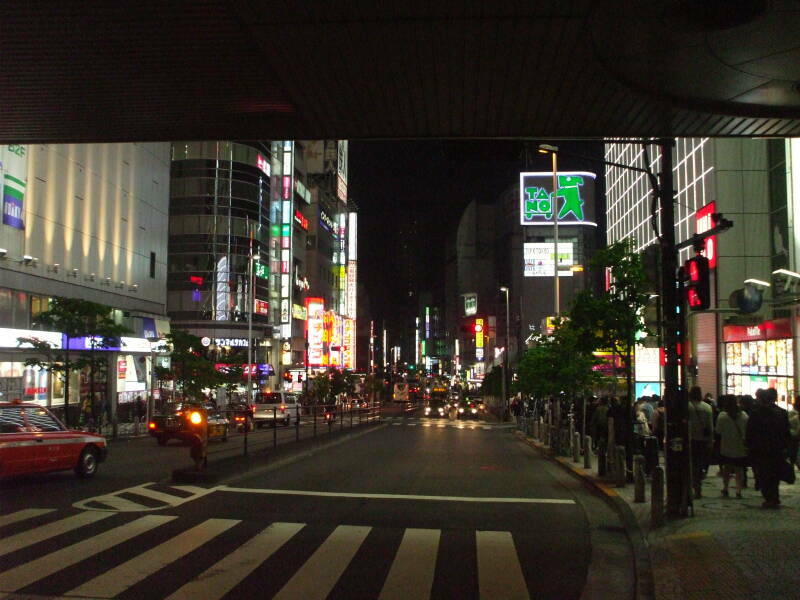 This includes the handy JR Yamanote Line running in a loop around central Tōkyō. The private Odakyu Odawara private railway line handles 490,000 passengers per day, with connections to the southwest. The Keiō Line private railway line handles 720,000 passengers per day, with connections to the west. Subway operations include the Toei Ōedo Line, the Toei Shinjuku Line, and the Marunouchi Line. Find your way to the northwest part of the station, and exit on the west side. Generally toward the northwest, anyway. There are over 200 exits. So, exit on the west side and then make your way north. Get close enough and then walk a little. Below, I have exited on the west side near the north end, and I'm facing north. 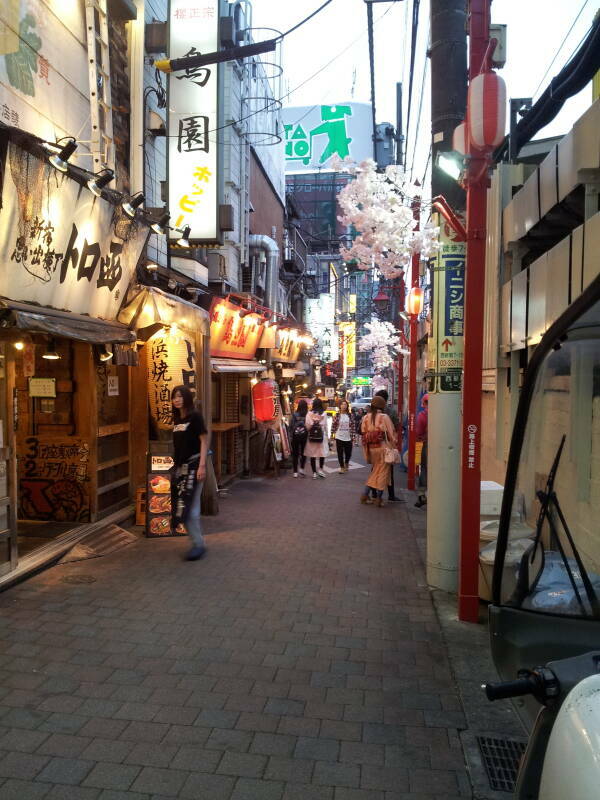 I'll want to go toward the green sign in the distance, just to the left of the tall building with the Uniqlo sign. 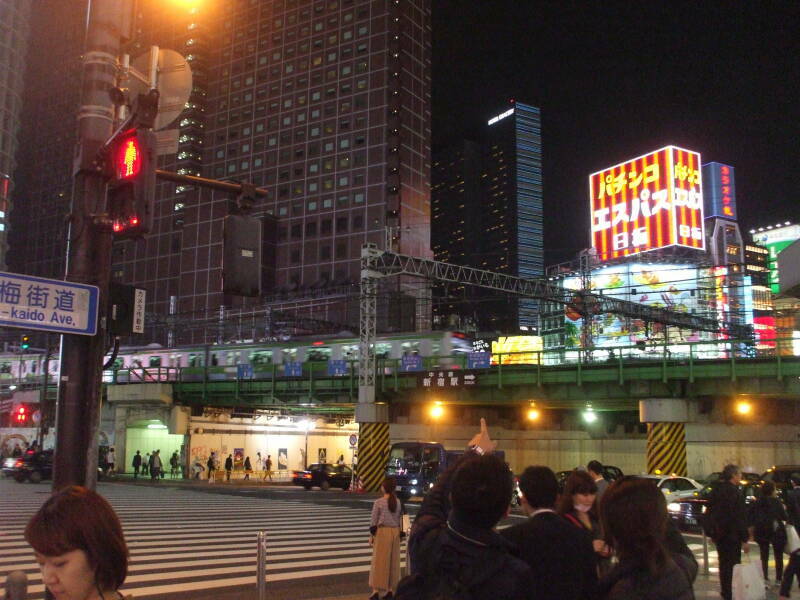 Here, I'm looking across the busy bus station toward the west and some of the Shinjuku office towers. 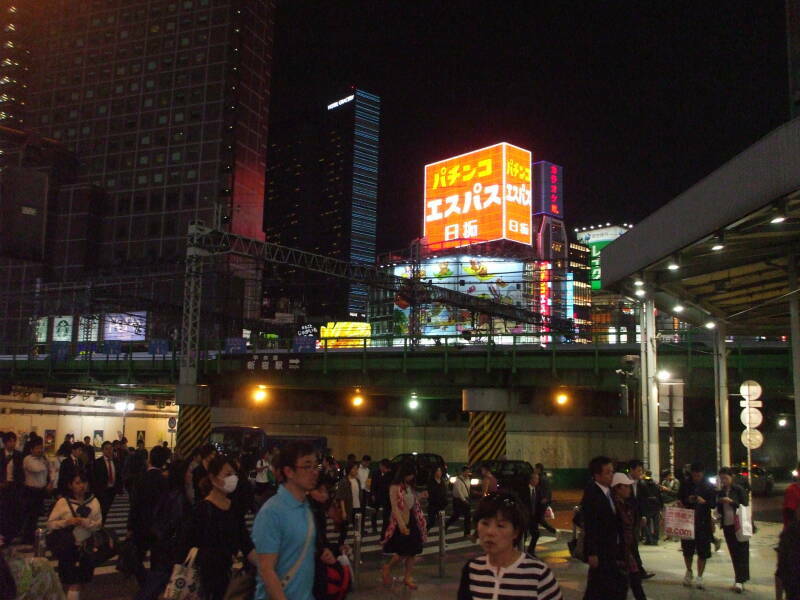 I continue to the north along the west side of Shinjuku Station, passing through an overpass. 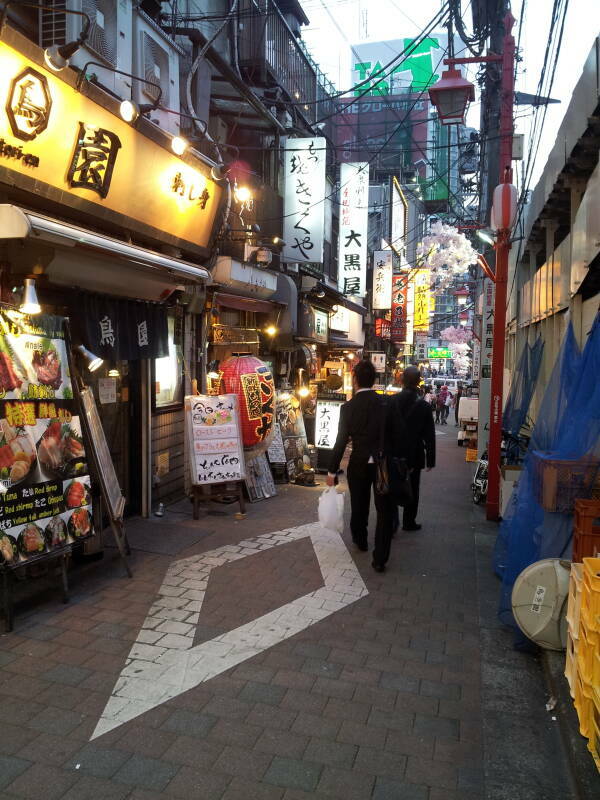 Turn to the right around the northwest corner of Shinjuku Station. Below, I'm looking toward the above-ground JR rail lines exiting the north end of the station. 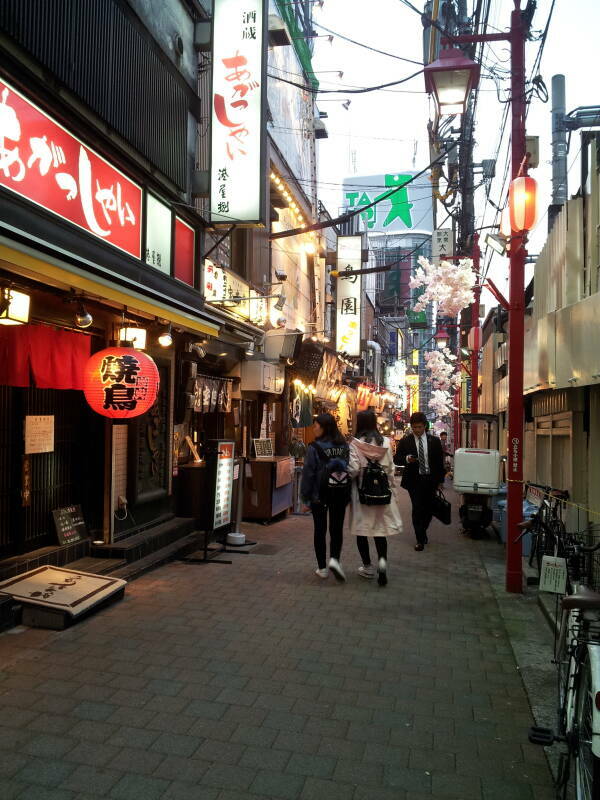 The first picture below shows the entrance to the lane leading down through the center of Omoide Yokochō. 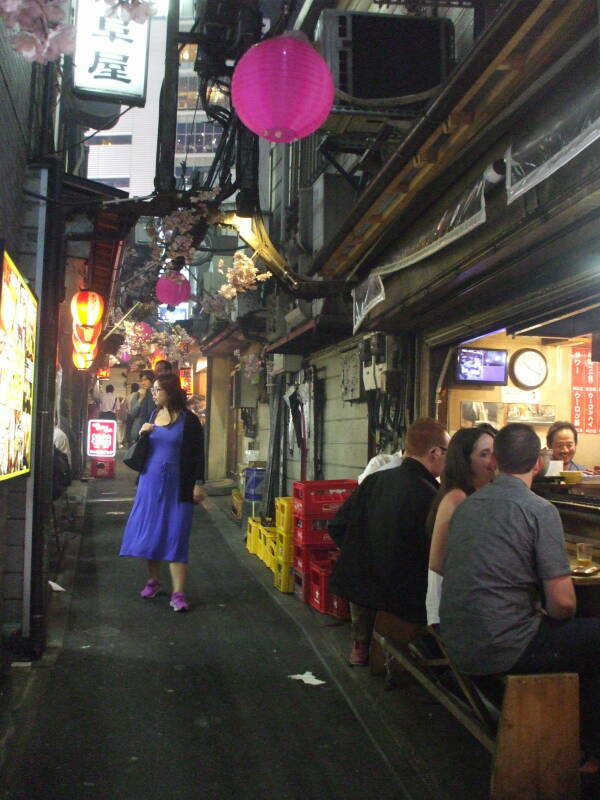 The second is the lane along its east edge, with the rail lines overhead to the right. 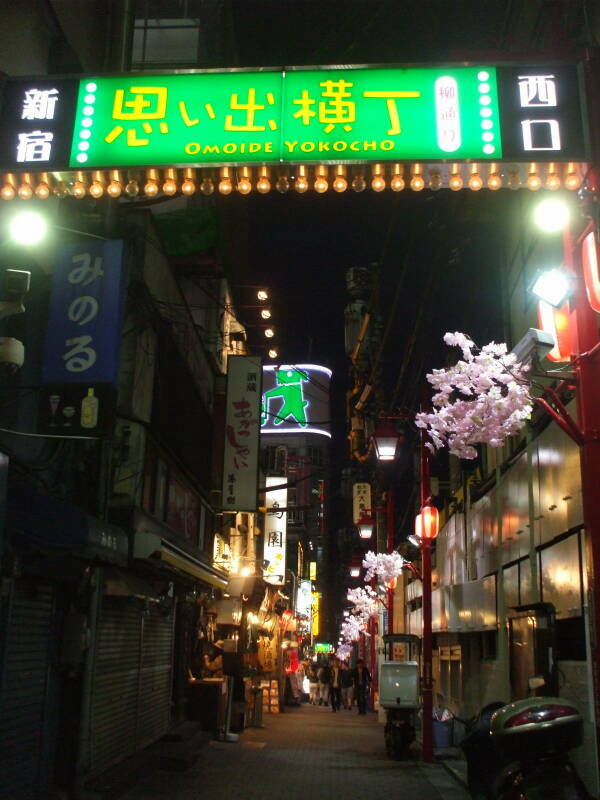 Yes, Omoide Yokochō literally means "Memory Alley". 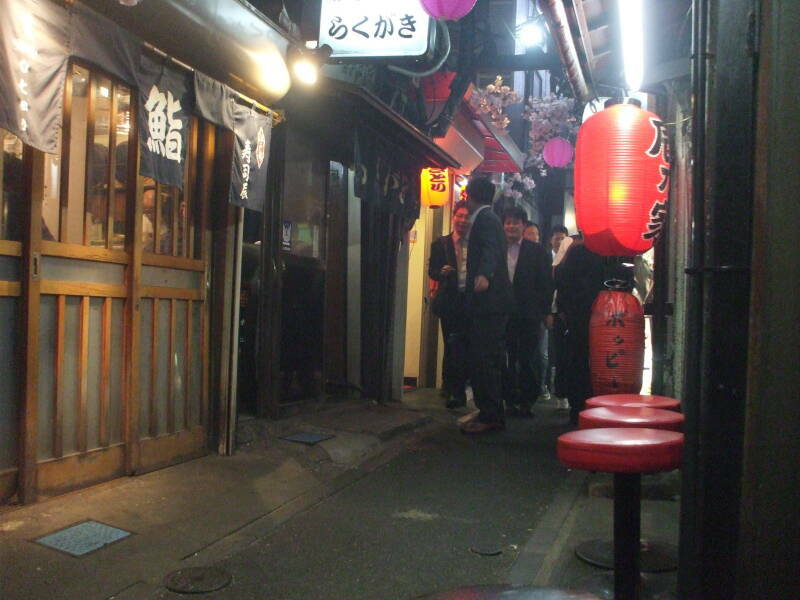 Locals, however, often refer to it as Shomben Yokochō or "Piss Alley". 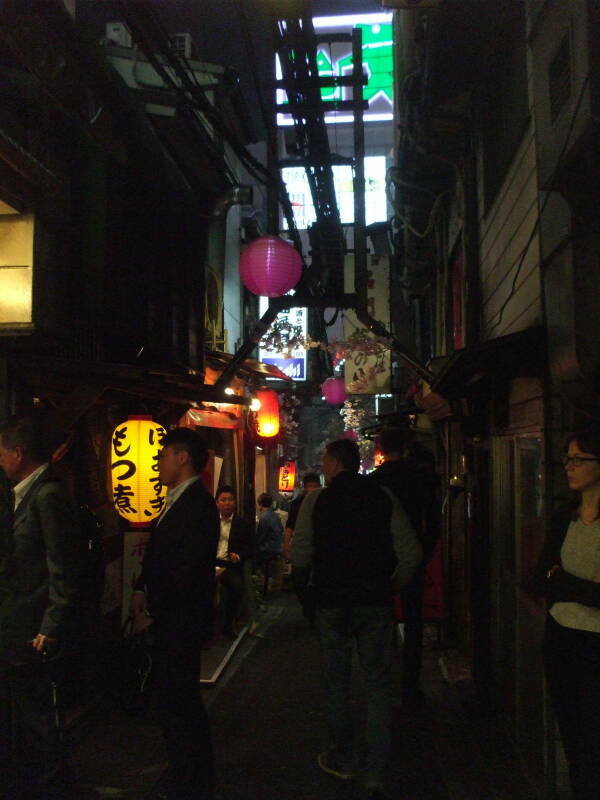 Let's wander through the passages and pick a place to eat. 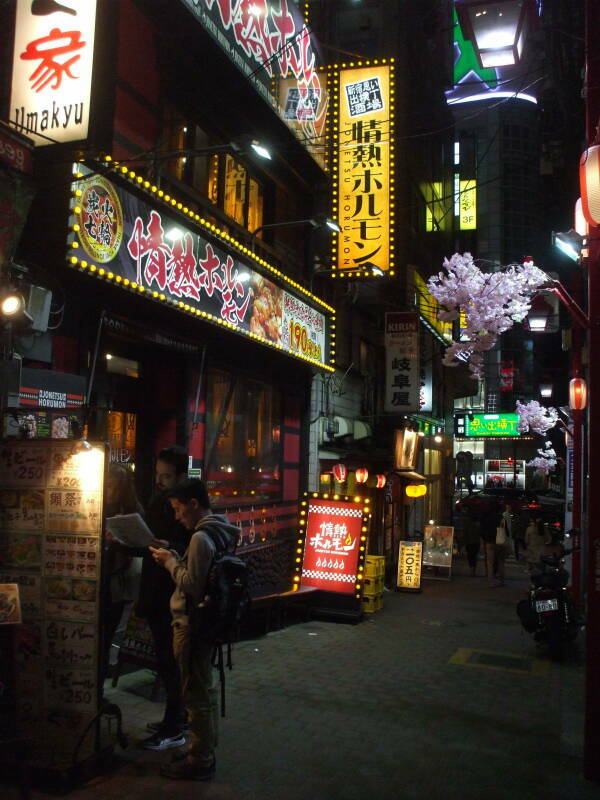 A few places have multiple signs written in English saying "English menu available". Avoid those places. 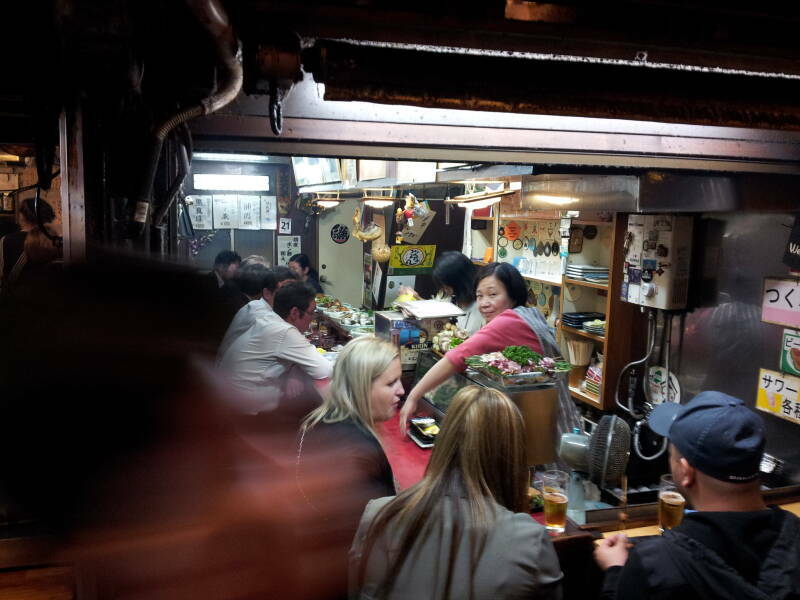 Go into an izakaya with little to no visible English. They may have an English menu. But if not, simply point. 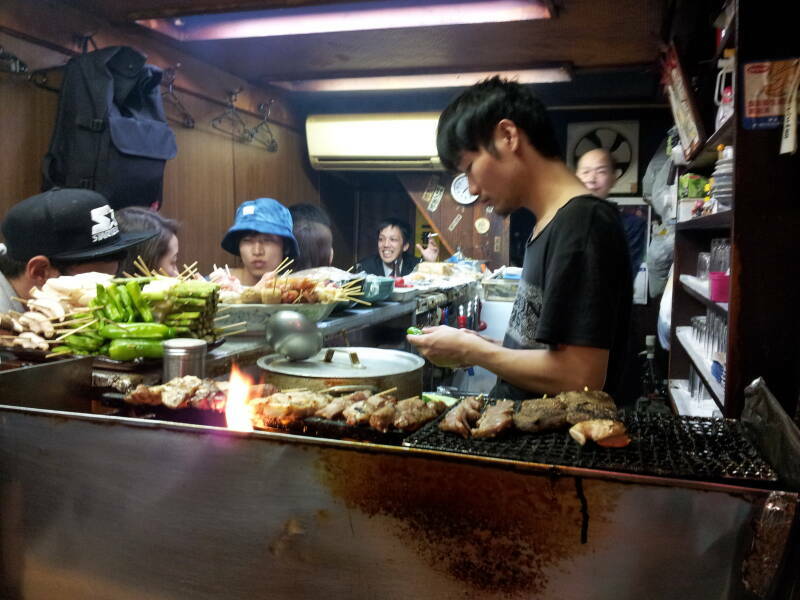 Look at what they have ready to grill, and at what others are having, and point and smile. It will work. 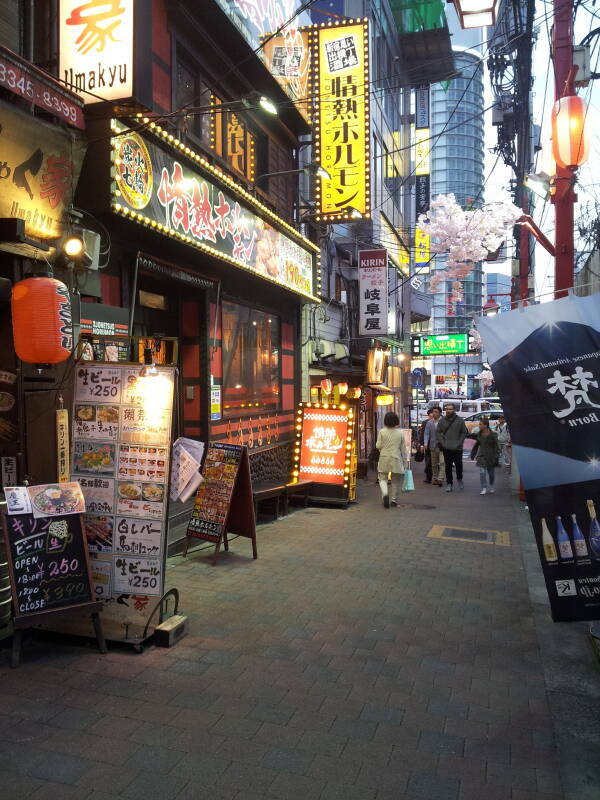 Have something to eat and something to drink. 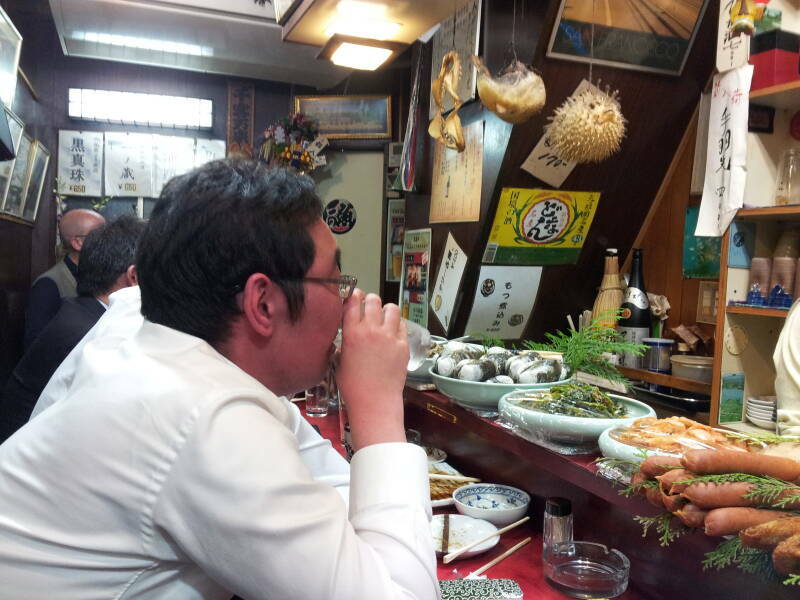 "If you get a drink, you should have something to eat. To drink without eating, well, that's English." 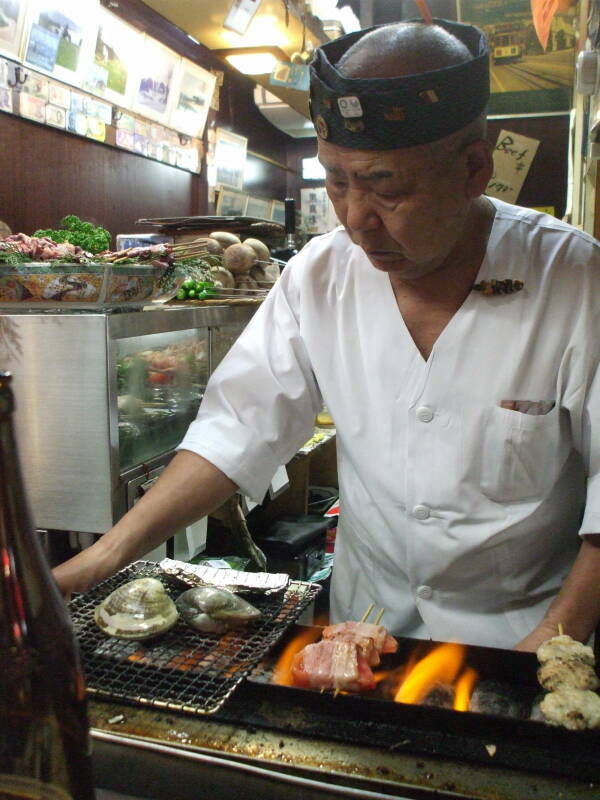 Yakitori or grilled chicken is the common choice. But there are many alternatives. 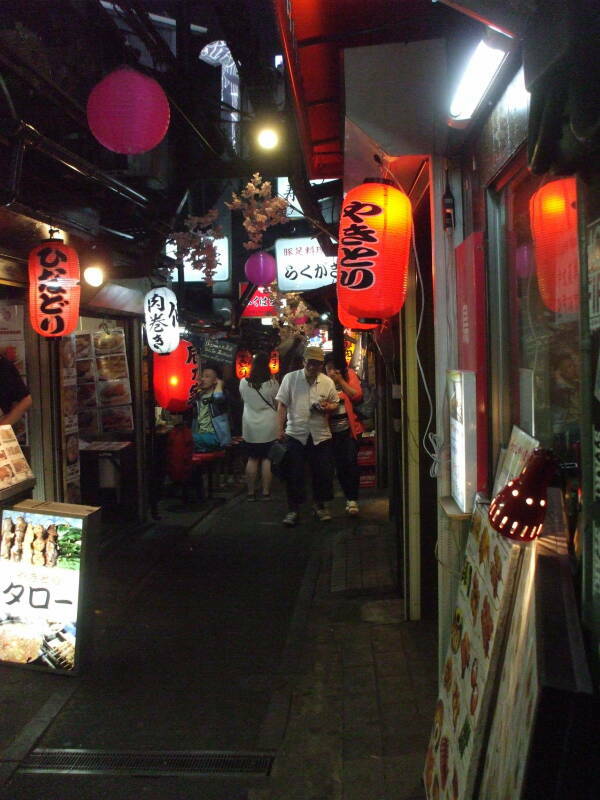 I visited Omoide Yokochō on several nights. 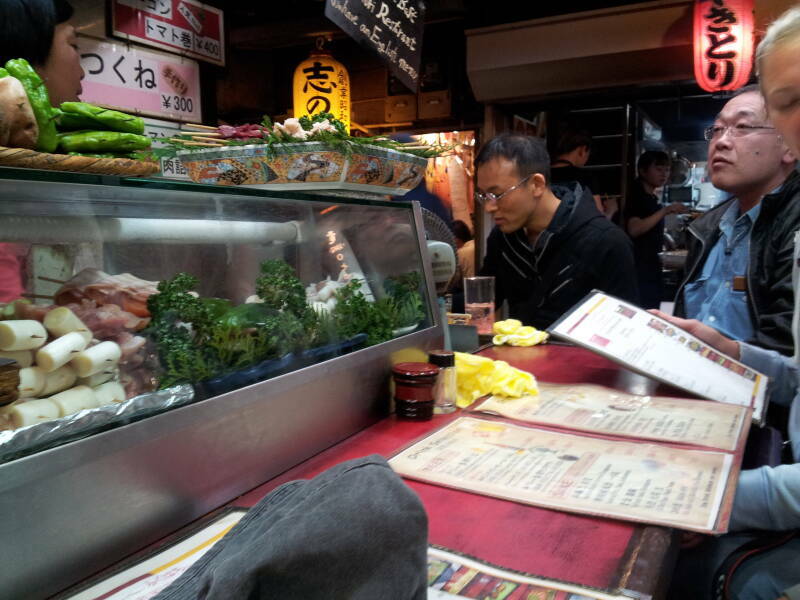 There were a lot of dishes to try in several places! 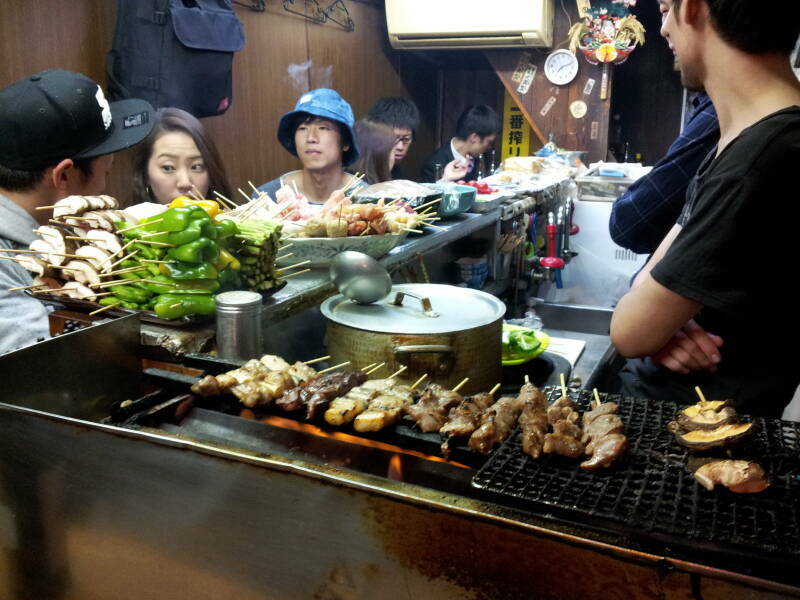 There is chicken yakitori, of course. Plus seafood. Plus grilled vegetables like these peppers. 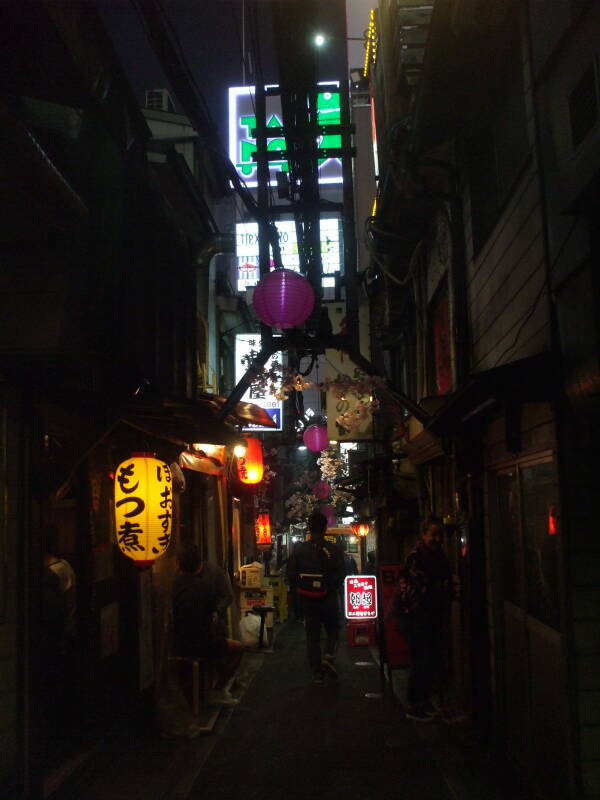 Sit along the passageway and watch the world pass by. If you're learning katakana and hiragana, らくがき is hiragana for ra-ku-ga-ki. That's what the white sign says, I have no idea what it means. 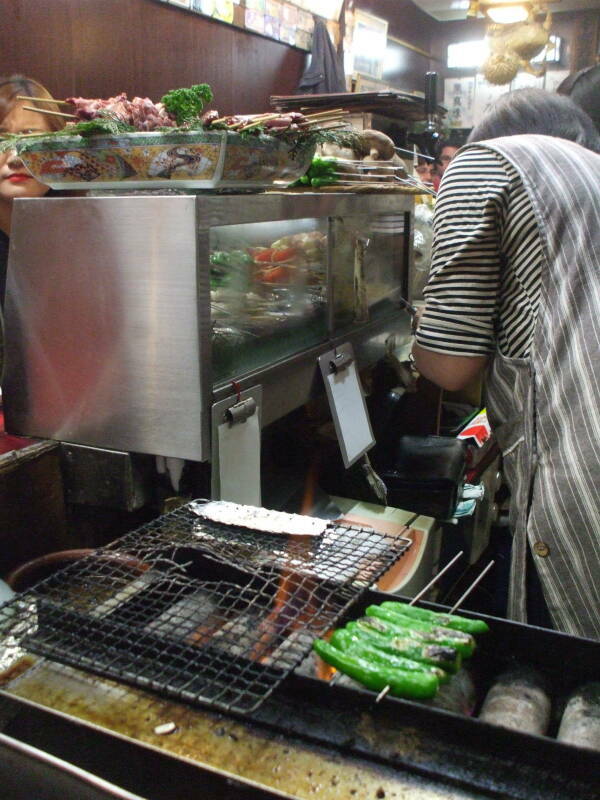 Above you see a list of choices, all ¥150 each. 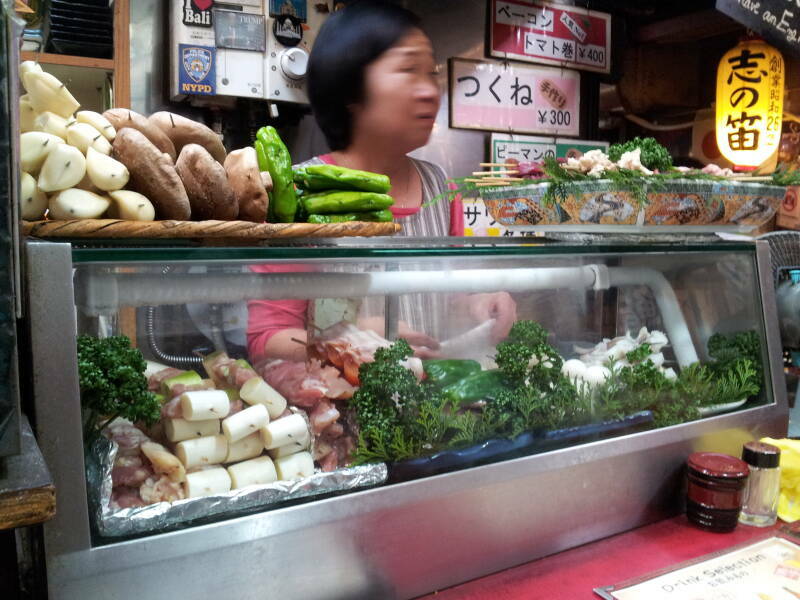 The exchange rate was ¥110-115 per US$ so these are low-cost dishes. 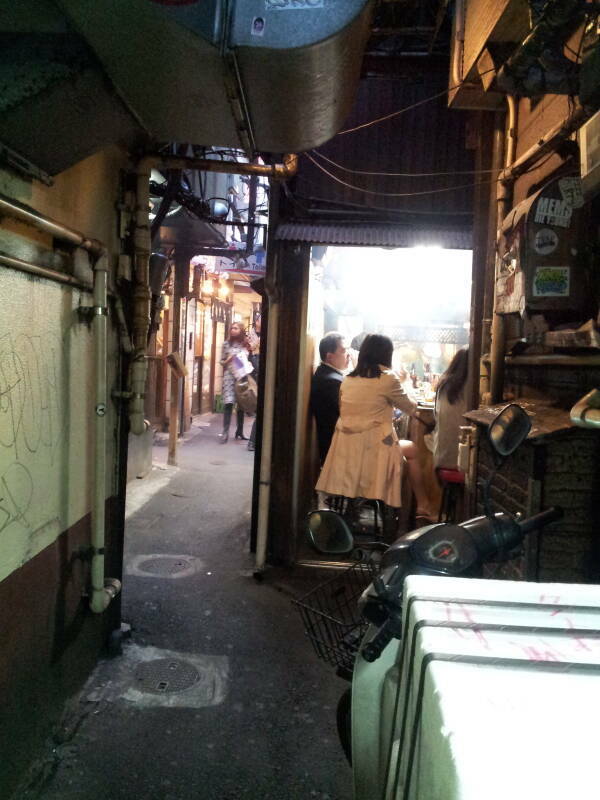 Do you see that sign above and below, トイレ or to-i-re? That means toilet. 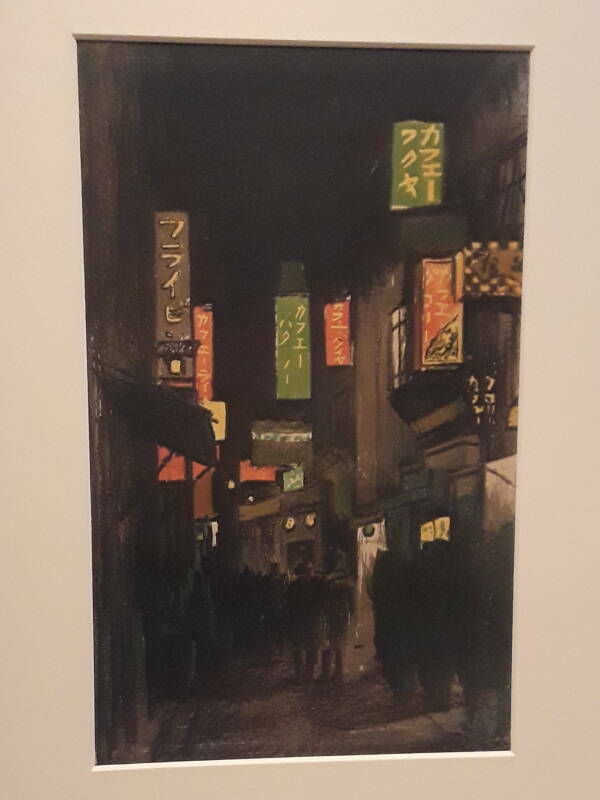 You will usually see male and female silhouettes as on this sign. 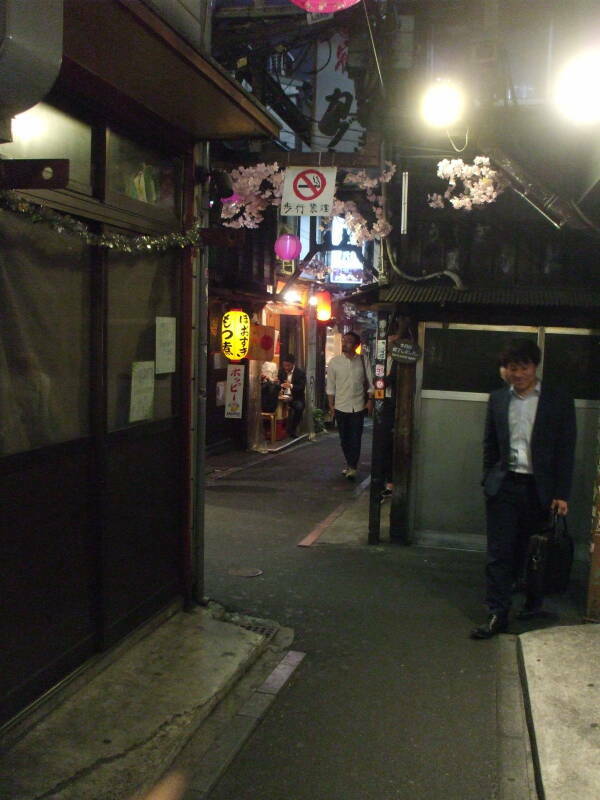 There's no longer any need to call this area Shomben Yokochō. 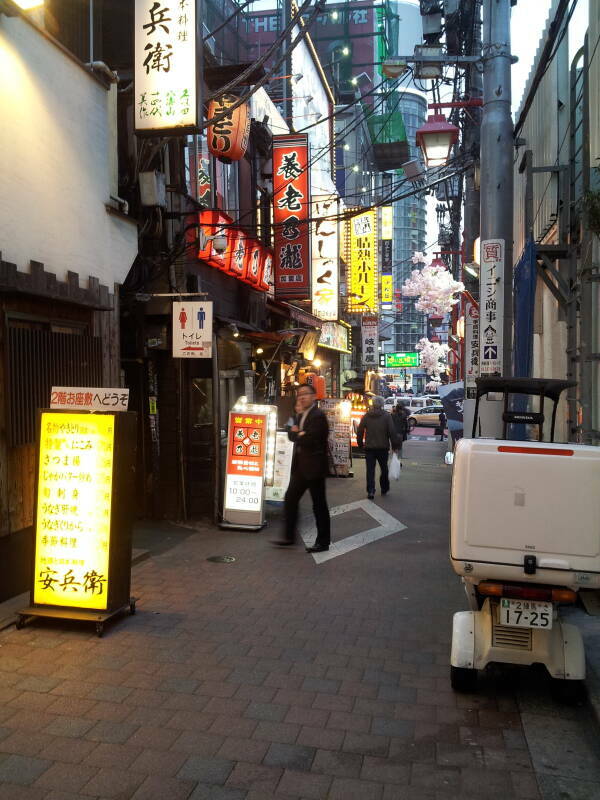 See my page on Japanese toilets for everything you need to know. There are plenty of them, they are very clean, but they may be far more complicated than you expect. 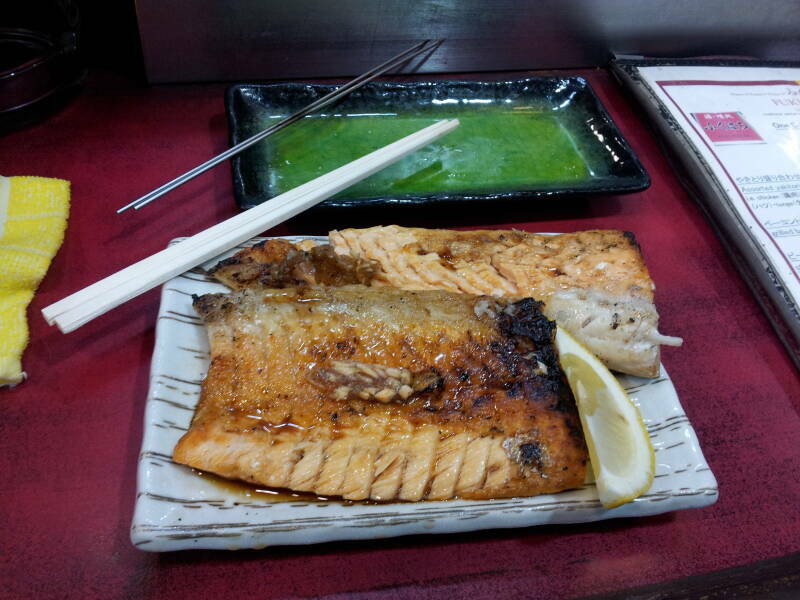 Grilled salmon is very good, and surprisingly inexpensive. 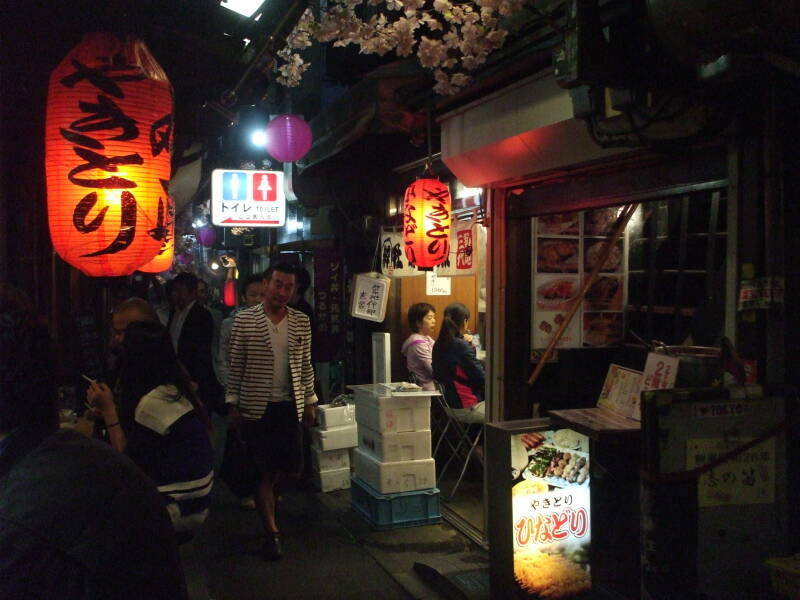 Yes, food and drink were expensive in the late 1980s in Japan. But that was during a crazy economic bubble, and it's long since past. 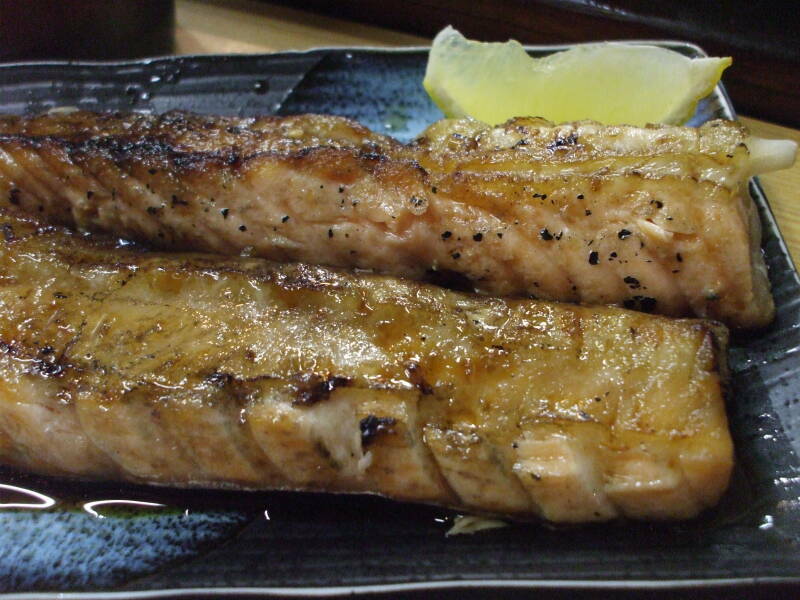 "Salmon" is sha-ke, しゃけ in hiragana or シャケ in katakana. Or maybe it will be spelled sa-ke, さけ or サケ. 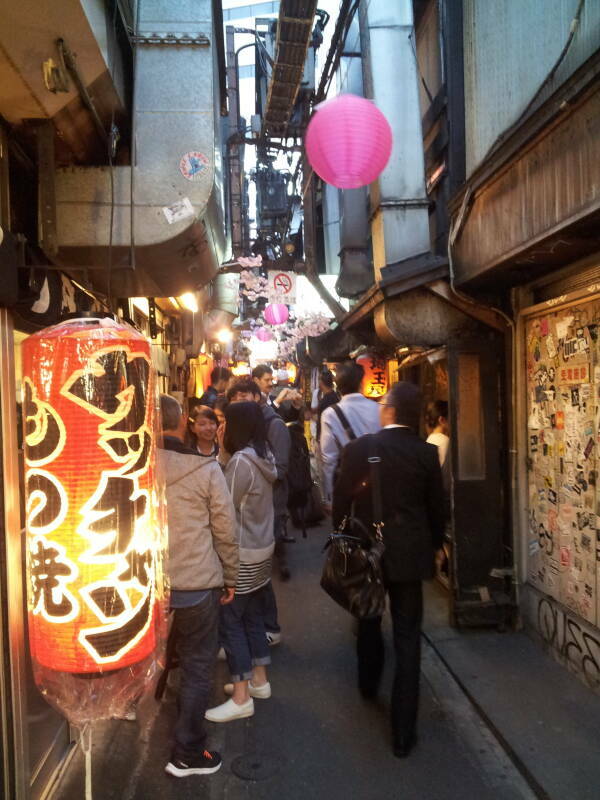 Or it might be transliterated sāmon or サーモン. 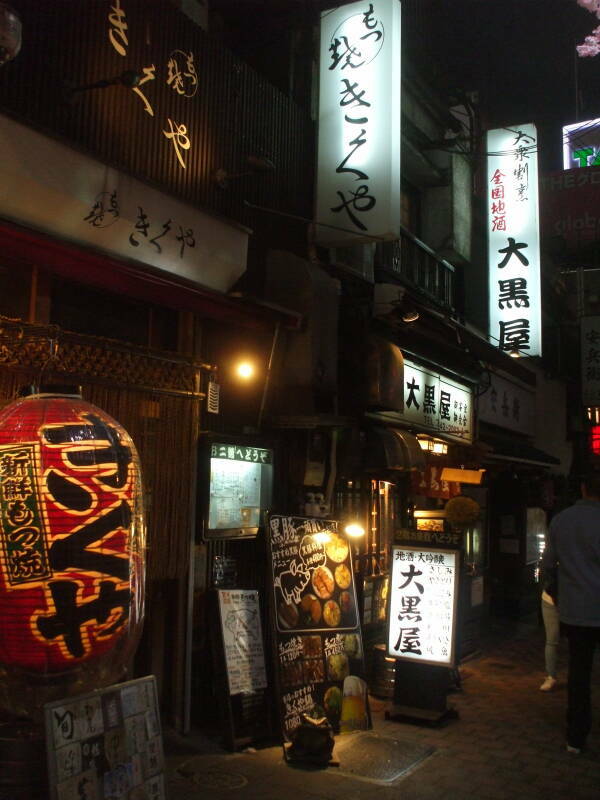 Sa-ke is easily confused with the rice wine sa-ke or 酒. Make sure they know you mean the fish. 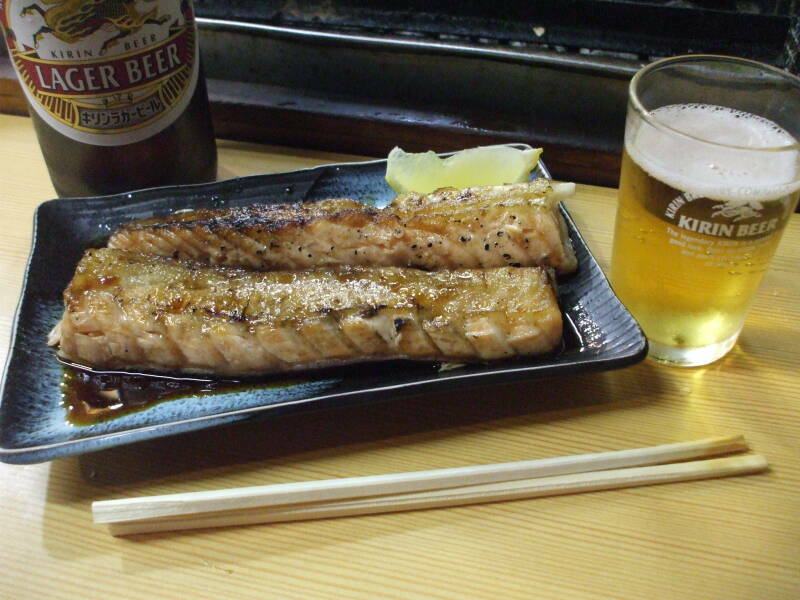 Ask for biiru or ビール first, then they will know that the sa-ke is the fish. 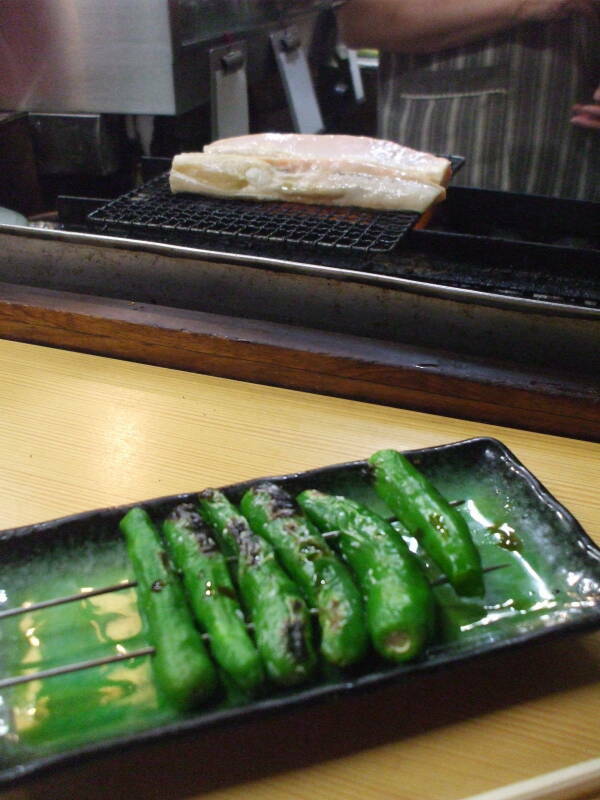 Or find サケ in the menu and point to it. 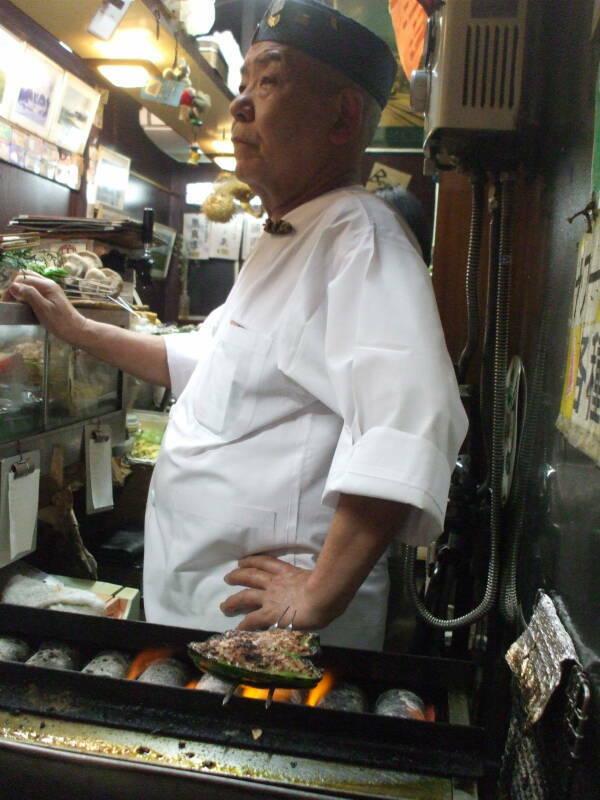 Or ask for サーモン or sāmon. Let's watch the master work his magic. 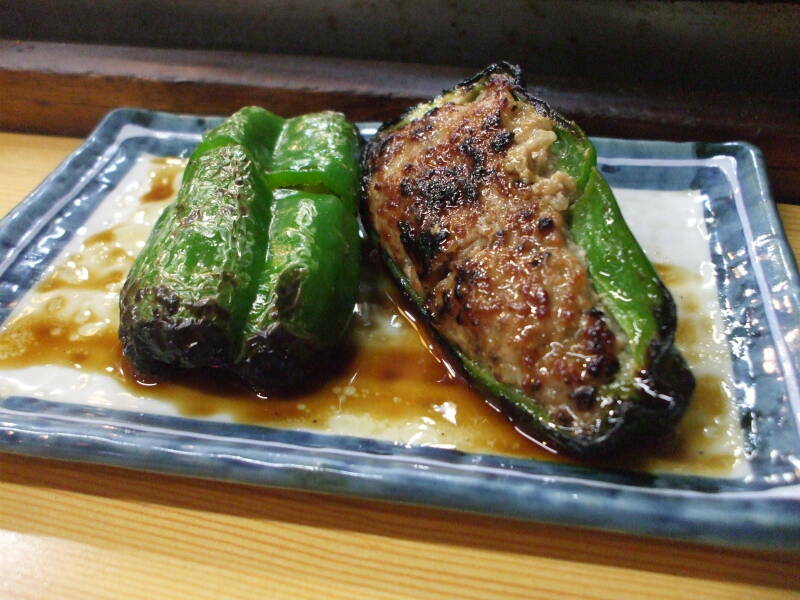 Now I'm having grilled pepper stuffed with ground chicken. 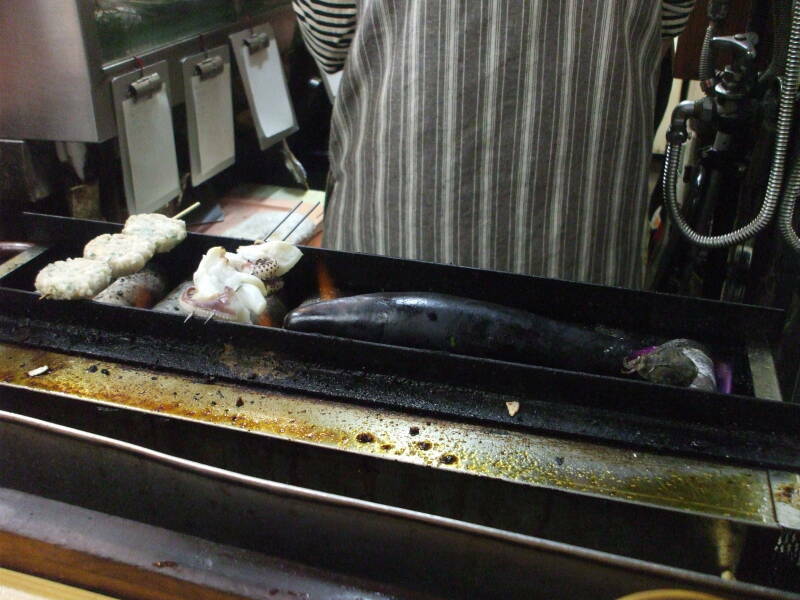 It's on the grill above, then served to me below. 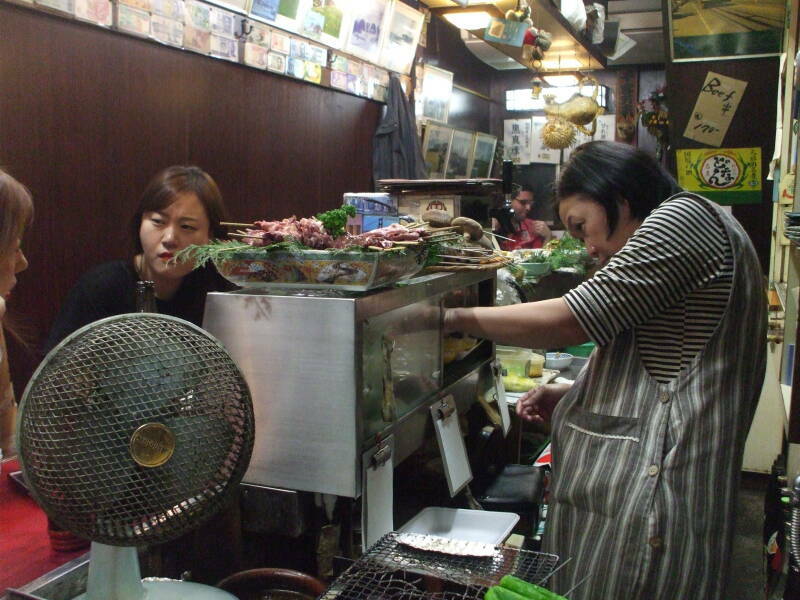 Above, that's a large eggplant (or aubergine), along with some octopus and ground chicken patties. 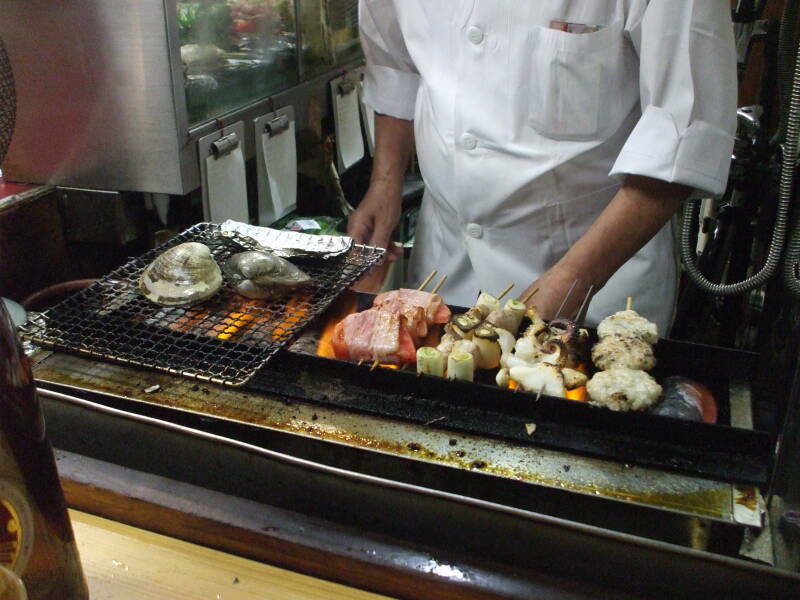 Below from left to right it's two clams, tomato with bacon, grilled vegetables, octopus, and ground chicken patties. You don't have to wait until it gets dark. Don't stay too late! 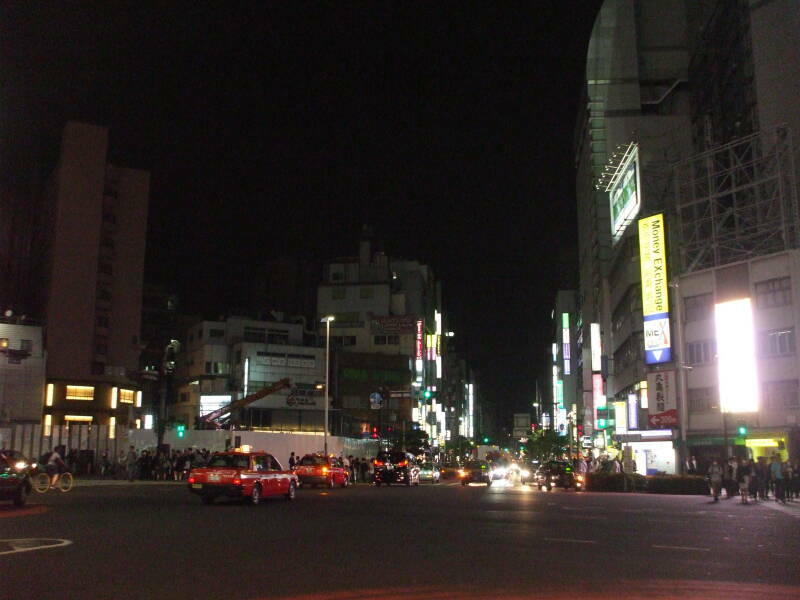 The subway and trains shut down just after midnight and taxis are very expensive. The subway and trains start running again about 5 AM. 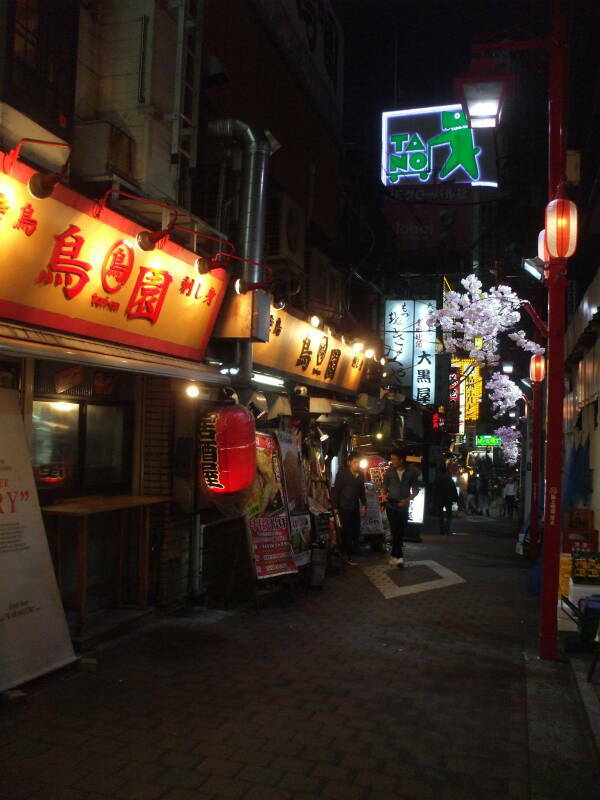 The last picture above is looking north from the northwest corner of Omoide Yokochō. Below, a train departs Shinjuku Station to the north. 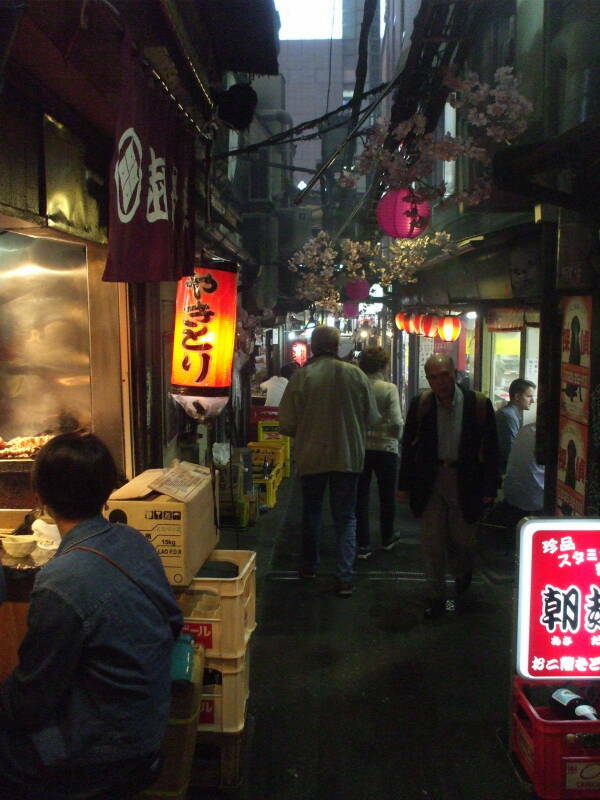 Above and below, we're looking east along Yasukuni Dōri from the northwest corner of Omoide Yokochō. JR East trains run on those lines over the green bridge. 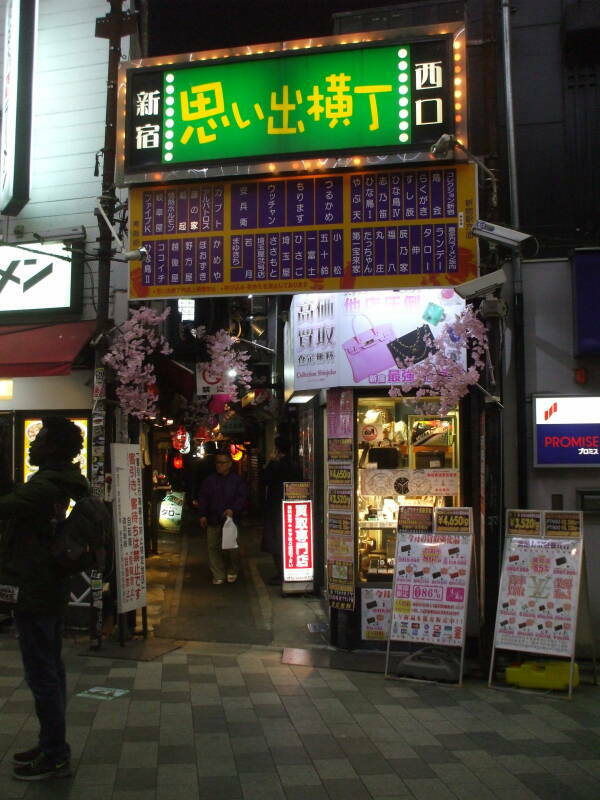 Shinjuku Station is definitely a full-service transportation hub. It's like a fully self-contained, self-sufficient space station. 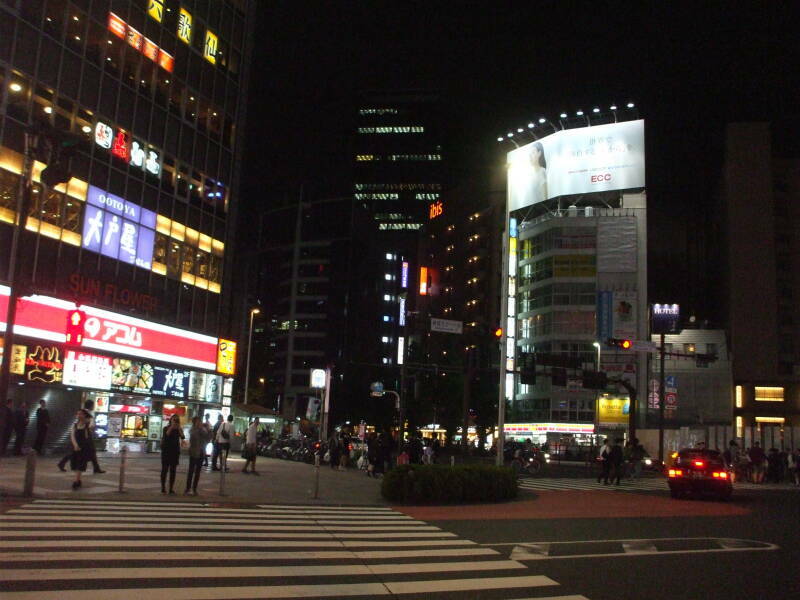 Several department stores and multiple shopping malls are included in the overall structure. 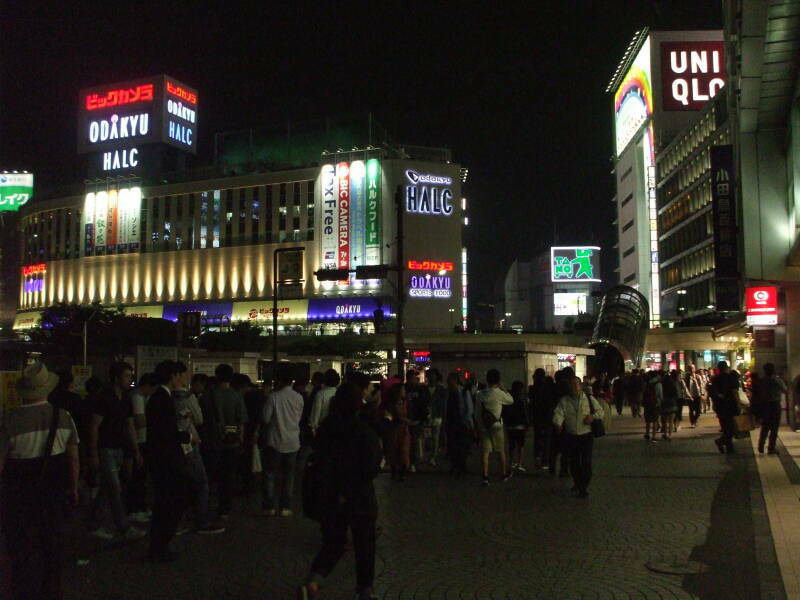 Lumine Est, Odakyu, Odakyu Mylord, and Keiō department stores, and the Lumine 1, Lumine 2, Keiō, and Odakyu Ace shopping malls. 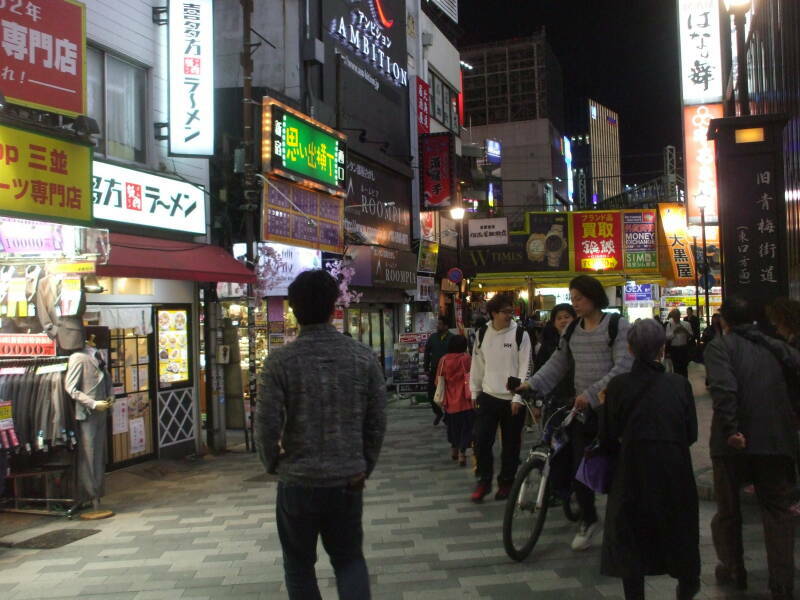 Plus the Metro Promenade shopping mall, which connects to the Shinjuku Subnade shopping mall, and more shopping areas reached through various enclosed passageways. Going above ground, office towers extend 30 stories and higher. 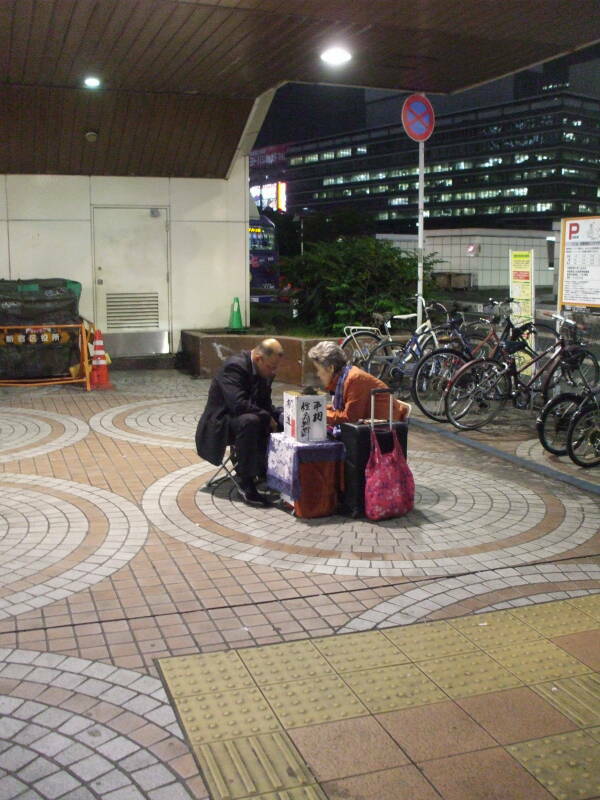 And if you find yourself pondering your future at Shinjuku Station, fortune tellers wait for clients just outside the station exits. 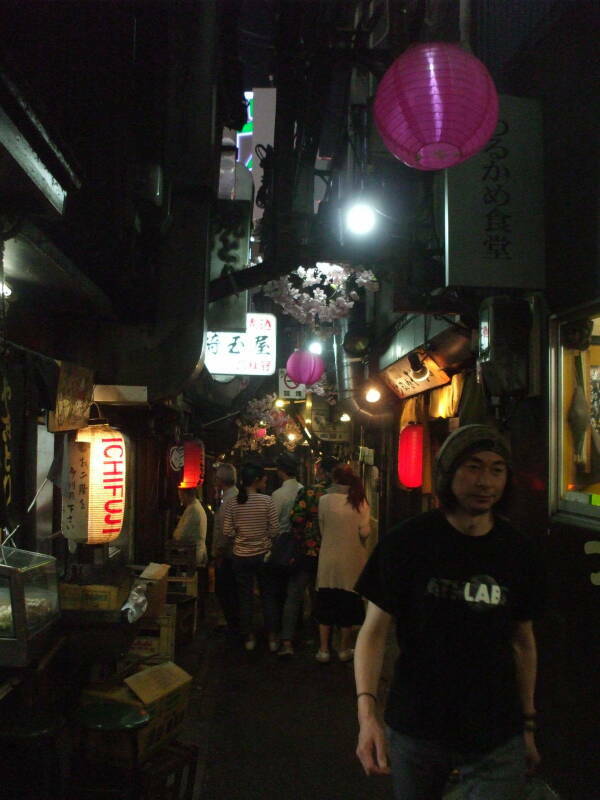 Shinjuku has been a nightlife area for a long time. 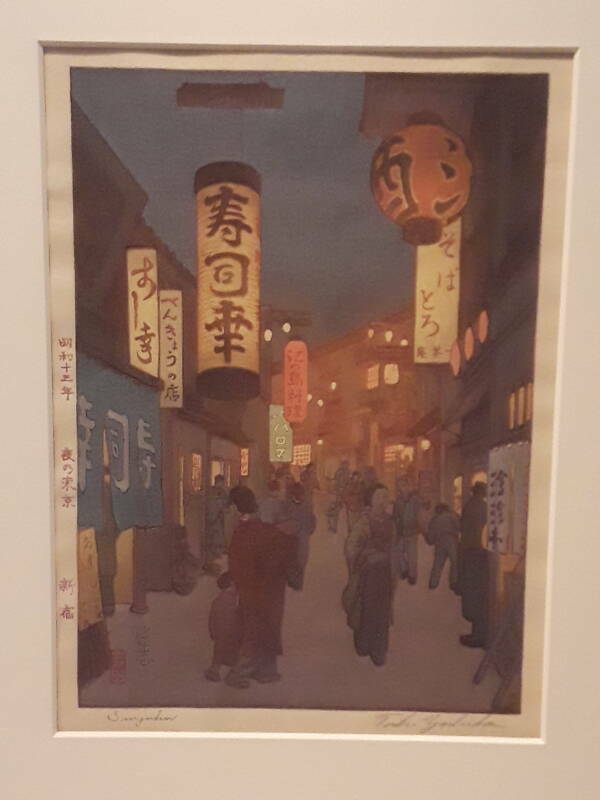 The below prints are in the collection of the Art Institute of Chicago.